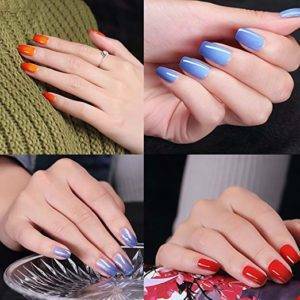 FairyGlo is one of best color changing nail polish brands when it comes to temperature changing nail polish. because their color shifts can be pretty dramatic. A lot of thermal polishes tend to be between different shades of one color, like light blue to a darker blue. FairyGlo has some of those as well, but they also have more unexpected shifts from light blue to dark pink or from pink to olive green. The formula isn’t too thin and most polishes are opaque in two coats, though some may need three coats. They aren’t the fastest curing on the market at 60 seconds under LED bulbs. but makes up for that with staying power. 1 : Gently buffer your nail surface so they’re not shiny and smooth. 2 : Apply base coat – cure with LED or UV nail dryer. 3 : Apply 1st thin coat of polish – cure. 4 : Apply 2nd thin coat of polish – cure. –Apply 3rd coat if necessary. 5 : Apply top coat – cure. 6 : Wipe nails with rubbing alcohol(cleanser) to remove residue. Curing time UV light for 2 mins, LED light for 30-60 secs. 7 : Enjoy your Manicure last for 2~3 weeks.